Charley was our first ever franchise! She loves it so much she’s onto her third Duck Truck. And the whole of Norfolk love her too, she is a regular along the coast at horse trials, county shows, festivals and food fairs, as well as frequent streetfood markets in Norwich. You can also find Charley and her Duck Truck at Newmarket races July course all season. Get in touch with Charley if you want special evening food at your wedding (Ed had her at his wedding! ), party or any other event that needs a little bit of ducky magic! Despite the photo, Steve has never worked as a bouncer! Steve has been trading since 2014 and already spreading his ducky wings outside of Essex due to his popularity. 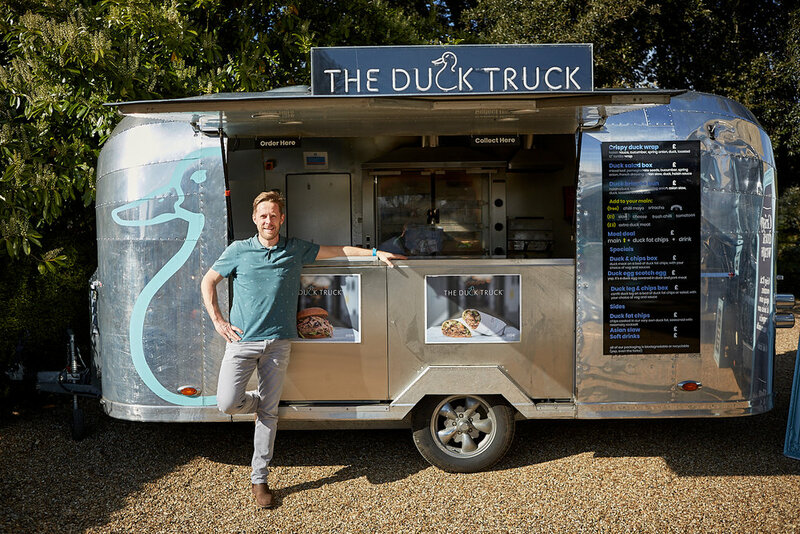 He just got his first shiny Duck Truck airstream and is ready to serve up our delicious ducky menu at an event near you. Steve frequents food & drink festivals, RHS flower & craft fairs, motor shows, country fairs, farmers markets and Christmas events, to name but a few. Get in touch with Steve if you want special evening food at your wedding, party or any other event if you want it to be quacking! Covers - the rest of the world! Ed’s original Duck Truck now goes around festivals and events all over the country. Some of our highlights have been Wilderness, Lost Village, Glastonbury, Latitude, Car Fest, Big Feastival, Henley Regatta, plus many more! We’ve been in this location since 2015. We are now an established part of the amazing Spitalfields community. We serve hungry bankers and local residents during the week and adventurous tourists at weekend. Our duck fat chips are insane! Check our some of our amazing reviews on google or trip advisor.